Providing Information and Resources to Help You Deal with Workplace, School, Cyber, Community, and Religious Bullying. Most of us understand how serious the problem of bullying is in schools and how it affects children, but we are also interested in dealing with abuse no matter where it happens and no matter the age of the targets. Less well known than the schoolyard variety is bullying which continues into colleges and universities and later into the workplace. So, while much of our information and resources are directed at school administrators, principals, teachers and parents we will also be focusing on real solutions to the problems of workplace bullying and its ugly cousin mobbing. It is not only school administrators and principals, but also business leaders from the CEO to the floor supervisor who need to have the tools to identify and deal with bullying effectively. 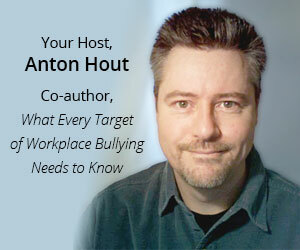 Bullying in the workplace is more than just a personality conflict. Bullying is a liability to your business. Fortunately, many managers, HR professionals, union leaders and EAP providers are beginning to recognize how bullying impacts business as a whole as well as the lives of employees who are targeted by bullies. Those who are subjected to bullying not only suffer from the daily torment but can become vulnerable to psychological, emotional and physical injury. Bullying can result in extreme levels of stress for the victims. We offer several stress management information articles and will continue to add more. Anxiety and depression also often accompany bullying. Fortunately, there are depression treatment options available. Depression is a serious condition and needs to be addressed. Stress, anxiety and depression are common reactions to bullying. In too many cases the victims are unable to cope with the incessant torment and feel they have no other option but to commit suicide to escape the abuse. Parents should be aware of the potential risks for suicide caused by bullying, or bullycide as it has become known. Parents should also be aware of the rise of the internet and communications technology as a tool for bullying. Cyber-bullying can be particularly cruel as it attacks a primary social arena of kids who increasingly live in a wired world. With cyberbullying there is no respite as bullies humiliate their victms 24/7/365 in front of an audience of thousands or millions. In addition to identifying and understanding the problems associated with bullying we also need to find real solutions. It is important to maintain our mental, emotional and physical health and wellness in order to minimize the impact of bullying. Sometimes we just need the support of family and friends, someone to just talk to about what is happening. A good idea is to seek out others who understand what you are going through. Although there are many online and local bullying support groups if there isn't one in your area it is fairly easy to start an informal group. We have information about setting up a local bullying support group and would be happy add your group to our growing list of OvercomeBullying.org Support Groups. We recommend that schools and businesses take an active role in creating a bully free environment. The personal costs to targets and the liabilities to which schools and businesses expose themselves by tolerating bullying are too expensive to ignore. More jurisdictions are passing legislation addressing "psychological harassment". Wrongful dismissal cases with record settlements, incidents of school and workplace violence and suicides are just a few compelling reasons to deal with bullying. Educate yourself, administrators, managers and staff/students about bullying. Implement and enforce an anti-bullying policy. Encourage targets of bullying to come forward and report bullying incidents. Follow through on reports of bullying with a view to addressing the abuse rather than silencing and intimidating the victims. Regardless of how you implement your anti-bullying policy or what systems you use to ensure it is followed we invite you to join us at OvercomeBullying.org in exploring real solutions to the very serious problems of bullying, harassment and mobbing. Thank you for visiting OvercomeBullying.org. Please bookmark this site, sign-up to receive our free newsletter or subscribe to our RSS feed so we can stay in touch. Let's all work together to overcome bullying in our schools, our workplaces and in our lives.